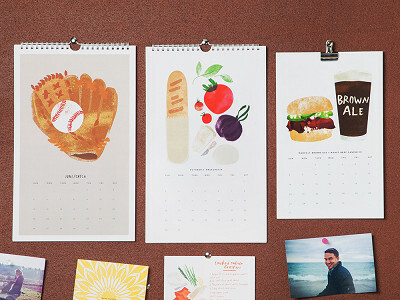 Mark the months with cheerful, colorful calendars you’ll be happy to display all year long. Redcruiser’s charming illustrations come straight out of Founder Heidi Schweigert’s sketchpad. Following a successful graphic design career, Heidi decided to focus on what she is most passionate about. She returned to sketching, a favorite childhood pastime, and created a hand drawn calendar for family and friends—who encouraged her to make them for the masses. The calendars quickly gained notice for Heidi’s personal and distinctive drawings. Because her inspiration is sparked from things she loves—from gardening to entertaining—they easily draw you in. Redcruiser prints on 100% post-consumer waste paper and hand assembles all of their goods in Minneapolis. Each piece is gift-ready, and the perfect thing to keep on hand for host or teacher presents. This original artwork is as engaging as it is frame-worthy. 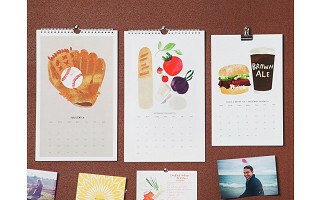 Mark the months with cheerful, colorful calendars you’ll be happy to display all year long. Redcruiser’s charming illustrations come straight out of Founder Heidi Schweigert’s sketchpad. 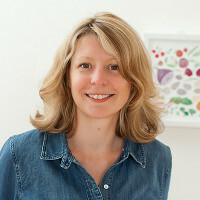 Following a successful graphic design career, Heidi decided to focus on what she is most passionate about. She returned to sketching, a favorite childhood pastime, and created a hand drawn calendar for family and friends—who encouraged her to make them for the masses. The calendars quickly gained notice for Heidi’s personal and distinctive drawings. Because her inspiration is sparked from things she loves—from gardening to entertaining—they easily draw you in.